Bradel bindings are a style of German, hollow-backed, cased-in structure. I’d mentioned in a previous entry that I was going to attempt this structure, and I showed an in-progress shot of the text block. Well, I can now happily show off its final form. The book is intended as a space for M to store his (our) homebrewing recipes over the years, so I peeled a label from one of his favorite beers and used it as a cover decoration. 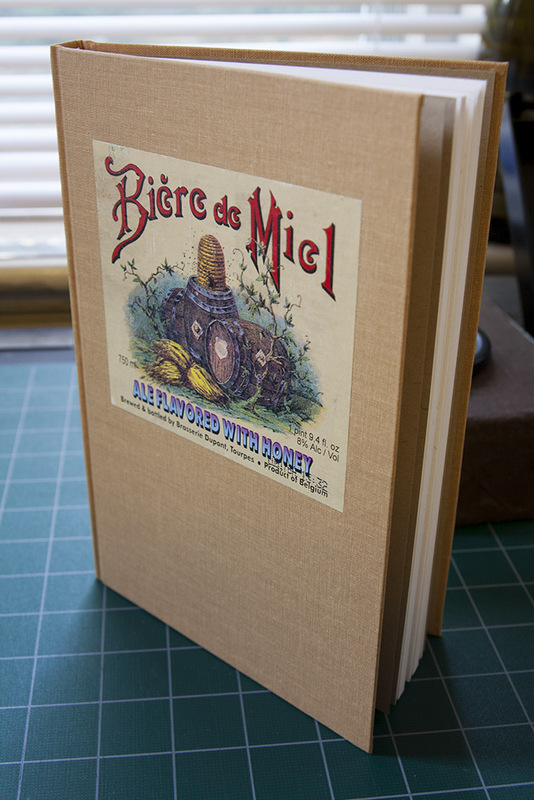 The book cloth compliments the label color while at the same time being reminiscent of the color of many beers. In the end, I think I was more pleased with this book than any other I’ve ever bound. The cover, complete with a repurposed beer-bottle label. This book had enough swell to force me to attempt to back it—no easy task without the right equipment. I faked it with a bonefolder, straight edge, and a fair bit of hand strength. The shoulder of the bradel structure. I was pleased with how this came out, considering. For this book, I sewed on the endsheets (instead of tipping them on), and I made paper endbands. 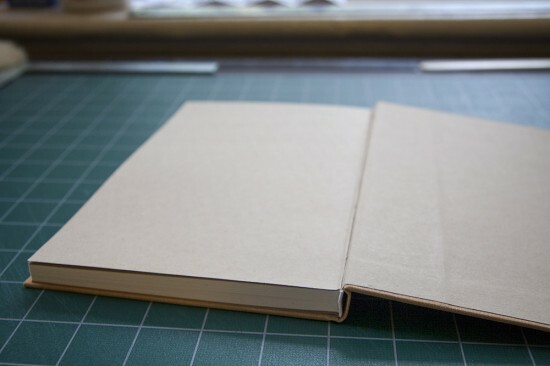 I would have liked to try something sewn for the endbands instead, but I was short on time, and the learning curve with the paper endbands was less. I went with the same paper as the text block, for simplicity’s sake. The book opened. 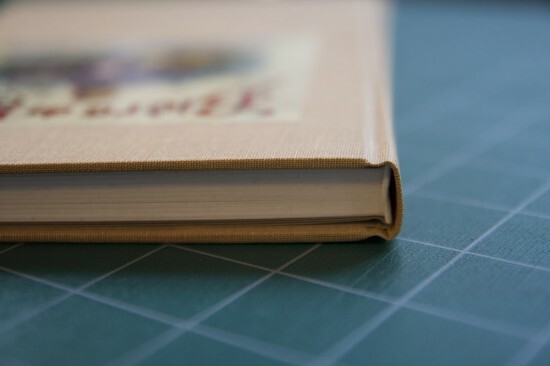 The flyleaf is pulled up only slightly, which I think speaks well of the work that went into this. Considering how happy I am with how this book turned out, I think it’s fair to say that I’ll be exploring the bradel structure further—not to mention repurposing many other labels (from beer, wine, and who knows what else) as cover decorations in the future. And of course it’s always wonderful to know that a hand-made object will receive much love and use. That is, if I may say so, effing gorgeous. Beautiful! Is that the special day gift to the special man? I love the whole idea and the execution is perfection. It’s actually something of a miracle that I was able to get this one off intact. But I liked how this came out so much that I have a feeling more practice is in my future.